What can new students at Holy Family Catholic High School expect? Why is it the best high school for my kid? To help out, we asked questions from the most credible, honest and believable sources­—the students who most recently transitioned from middle school to Holy Family. We call them Fire ’22. Why did you choose Holy Family? Libby K. – I originally came here for sports. I’m a hockey player. Once I was here, I found out it is a really good community. It’s small enough that there is a sense of team, but big enough that you can meet lots of different people. Ryley C. – I knew Shakopee (high school) would be too big of a school for me to enjoy. When I was at my Confirmation class, I saw Holy Family students serving food. From there, I got the idea to tour and shadow and decided this was the school for me. Maeve K. – The small class sizes really work for me. Sebastian G. – My mom wanted me to get in touch with God. It’s been good. Complete your application for enrollment by December 1 and the application fee is waived. How has the transition been from middle school to Holy Family? Luke G. – So far it is going well. The classes are much different than middle school—the amount of homework and the time in class taking notes. Ryley C. – Grades matter now. I didn’t act like they didn’t matter before, but now you’re in classes with upperclassmen. One thing I found out is, I like school here more than I used to and I’m excited to go every day. Cassie B. – Since I went to a huge middle school, it was easy coming to a much smaller school. But I had to adjust to the fact we have more work, but it’s manageable. They give you study halls. What is the biggest surprise or myth about Holy Family? Nick C. – Biggest changes I see…lunch is really good and you have classes with students from other grades. Libby K. – I kind of like uniforms because there is enough variation to express yourself, but there’s still unity. Cassie B. – I have some friends who aren’t Catholic. Everyone is very accepting, and that makes it possible for everyone to come here and enjoy it. Maeve K. – The upperclassmen are really inclusive and talk to freshmen. If I need help, the teachers are always there to give me a hand. Jack B. – The biggest myth—people who go to Catholic schools aren’t fun. It’s really fun here. What advice do you have for middle school students looking at Holy Family vs. other area schools? Nick C. – Holy Family is a smaller school. That means if you want to play sports, you can just about play any position you want. Luke G. – I’d say just talk with everyone and be yourself. Don’t be afraid to speak up. Cassie B. – I would say try it out. 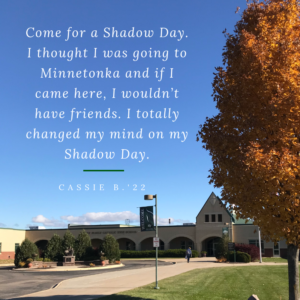 Come for a Shadow Day. I thought I was going to Minnetonka and that if I came here, I wouldn’t have friends. I totally changed my mind on my Shadow Day. I met a lot of friends. All you have to do is get involved. Maeve K. – Be open to anything and do your research because Holy Family is a great place to be. And because it is Catholic means we can say “God” and “Merry Christmas.” That’s a unique opportunity. Matt S. – Get involved in a fall sport. You meet a lot of people that way. Jack B. – Just shadow and give it a shot. If you like it, cool. If not, you get to miss a day of school. What is your favorite thing about being part of the HF “family”? Nick C. – My favorite thing is the atmosphere. It wraps the Catholic faith into school life with our daily convocations. Ryley C. – The community and the academics are really good. Briar C. – You feel safe being here. Matt S. – I’ve gotten to know a lot of people really fast because it’s a small community where you can actually know everyone. Applications completed before December 1 will have have the application fee waived.